Price: $0. €0. £0. ¥0. As of 13 January 2013, Edenwaith will no longer actively develop GUI Tar. In our efforts to focus on current and future projects, GUI Tar has been discontinued. 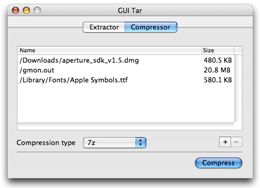 Since GUI Tar has been released under the GNU Lesser General Public License, its source code will still be freely available for others to use. Thank you to everyone who has used and/or contributed to GUI Tar.